A week into the Tea Party petulance that shut down the U.S. Government, a group called “Truckers Ride for the Constitution” threatened to roar into DC during morning rush on Friday October 11th with enough tractor-trailers to shut down traffic on the Capital Beltway surrounding Washington. The trucks would then drive to the White House and arrest President Obama for … well, something-or-other. Virginia and Maryland state troopers were mobilized. DC Metropolitan Police, Capitol Police, National Park Police, and Secret Service were on high alert Thursday night and into the wee hours of Friday. Then came the dawn. The U.S. Government is still out of gas, but Friday morning may see a colossal traffic jam on Washington’s Beltway … or maybe not. 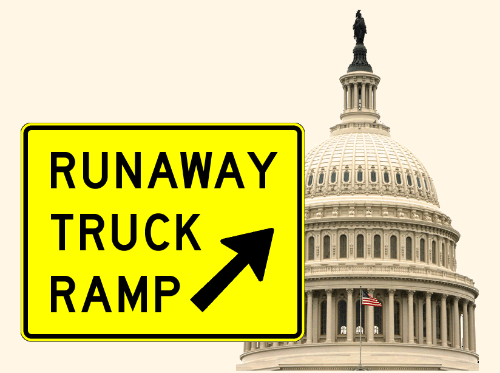 The Truckers Ride for the Constitution” has threatened to clog the Inner Loop of DC’s perimeter highway with semis to protest … something-or-other. Of course it all may be a hoax. Or something said in jest that was taken seriously by the story-hungry media. Hey, why not? It makes more sense than the Republican hissy fit that got us into this shutdown mess.